It's a weird name, I know. It's tiered. It's layered, swooshy and swirly like a pettiskirt, but the petticoaty layer(s) are on the outside. 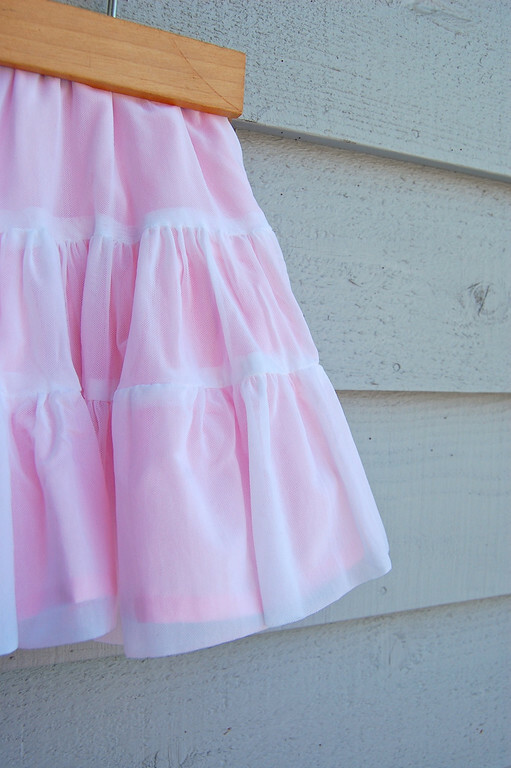 In essence, it is a simple tiered gathered skirt. The layers are very wide (i.e. they make a very large circumference) so that they are practically circular when twirled. The inner layer is regular lining - acetate, polyester, silk, whatever you like. The outer layer(s) are a soft mesh that doesn't fray. Initially, I thought this outer fabric was soft tulle, probably because of the visually-similar mesh pattern. I'd heard of a lot of pettiskirts made of soft tulle, whatever that was. Found the softest, finest tulle in the fabric store and it was still stiff. Asked the sales people if, perchance, washing it might soften it. "Definitely, " they said. "All new fabric has sizing, and washing will remove that." I was very doubtful, but I bought the tulle anyway, because it was cheap. Washing, I found later that day, did nothing to soften tulle. Tulle is tulle. People choose it to make tutus because it's that stiff. Decided that I needed to be looking for some kind of knit mesh. Went back to the fabric store and found it in the dancewear section. It cost more than five times what tulle did, not suprisingly. But for that price, you get a gorgeous drape and a slinky, soft, slippery texture that children would love to move in. No wonder it's used in dancewear, ice skating costumes, yoga apparel and other exercise outfits. Lovely. I've read about other pettiskirts being made of polyester chiffon - and that IS beautiful, luscious and swishy. But I wanted something less dressy. And I didn't want to spend lots of time basting and gathering layers and layers of it. So knit mesh it was - and just one layer of it was adequately opaque-yet-translucent. If I'd had the time, I'd have made two layers of it. It gathers beautifully, and doesn't even need finishing/hemming. For strength, I used french seams to connect the sides of the individual tiers, but otherwise, the edges were left unfinished. I left the hem of the knit mesh layer a little lower than the hem of the lining, to allow for shrinkage. The plan is to trim it to length after the first few washes. Here's a sketch of the dimensions for this pettiskirt. W is the waist measurement of the wearer. 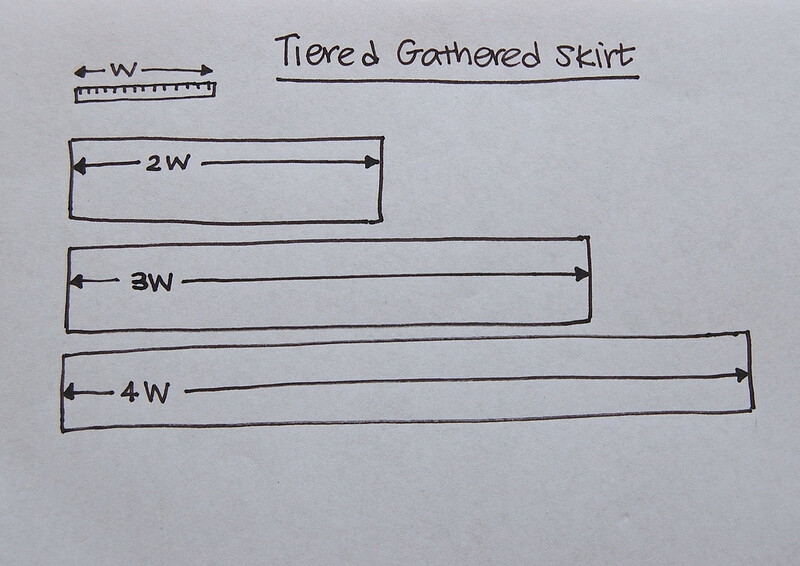 When I am sewing a regular gathered skirt, I usually use a 1.5W to 2W width for the skirt (this would be the kind that has only one tier), but that isn't sufficient for a skirt as circular as this. 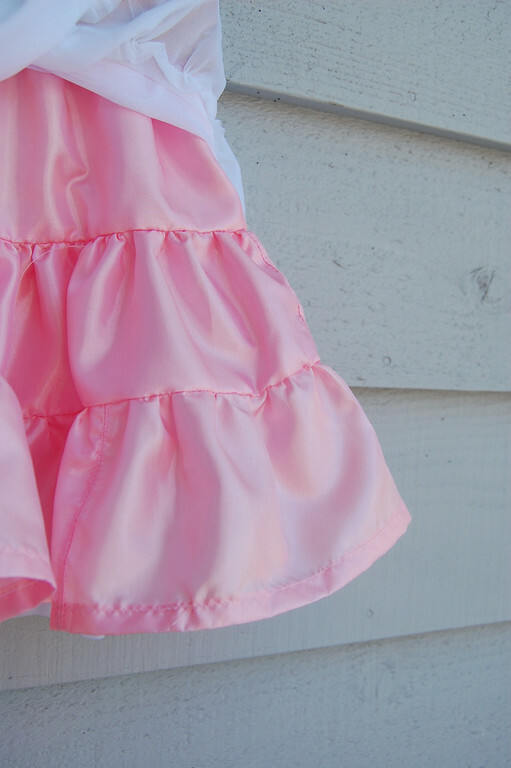 Otherwise, the method for constructing the tiers and waistband are the same as in the tiered skirt tutorial here. Remember that the ratios (2W, 3W, 4W etc) do not have to be followed exactly. Sometimes it helps to round them up or down according to the width of the fabric you bought. The total length of the skirt (from waist to hem) is divided roughly into three, so that each tier is a third of this length, plus whatever seam allowances are needed. The lining layer is identical to the outer layer, just in a lining fabric. You can find these lining fabrics in the apparel fabrics section of fabric stores. Some are specifically listed as cling-free or static-free and while they look suspiciously like thin ripstop nylon, they will work quite well for skirts like these. The knit mesh (which came in limited colors of white, skin tone and black in Joann Fabrics), officially called Power Mesh, was $10 a yard, at 60" wide. I needed just half a yard for each layer, and with a coupon, it came to just $2.50 per mesh layer. 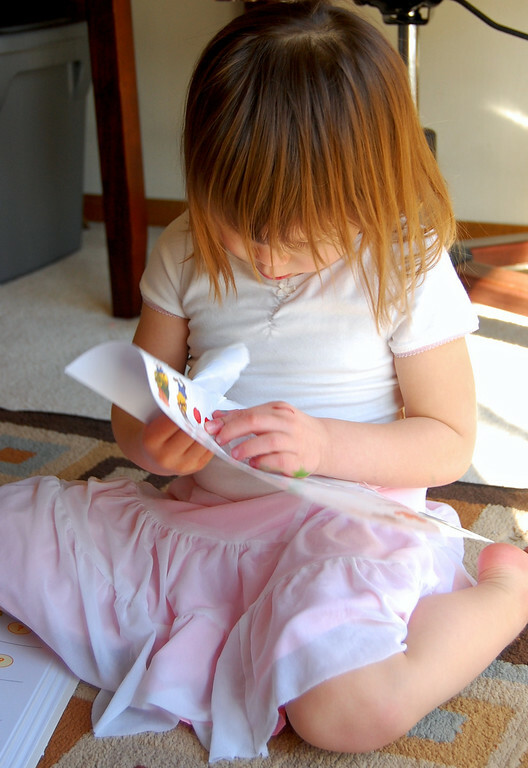 Remember to leave enough allowance in the top tier (the 2W one) to fold over at the top for an elastic casing. I used 1/2" elastic, instead of the usual 1", because it was daintier. Kate has worn this skirt every day since she got it more than a week ago. She wears it even over her PJs, carefully removing it each morning to undress, get into what we call Day Clothes, before slipping it back in place on her hips. I finally managed to sneak it away from her tonight to wash it. Not all the things I sew for the kids are so loved, so this one is definitely worth making multiples of. Not that you need another time-consuming hobby, though, lol. Thanks for this tutorial. One of my granddaughters loves this sort of thing and will totally wear it out by wearing it daily. I'm going to make her a couple of these. 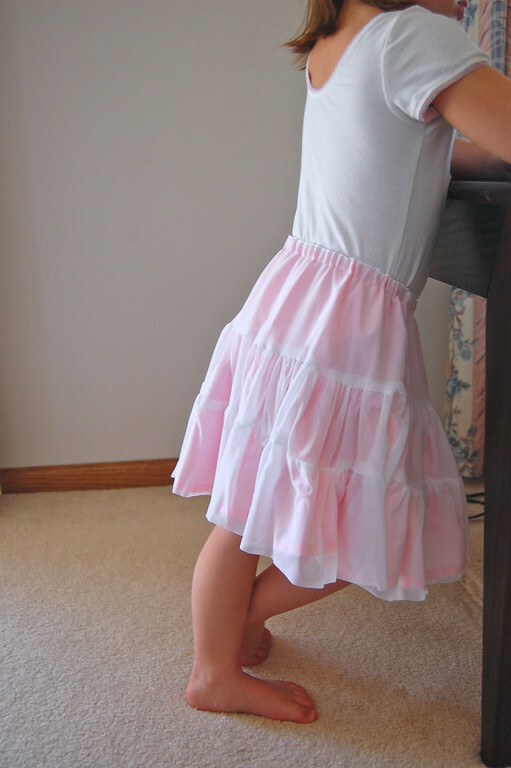 I love tiered skirts, what a coincidence i made a twirly Tiered Skirt Tute last week! I actually got back to wearing skirts after almost a decade! 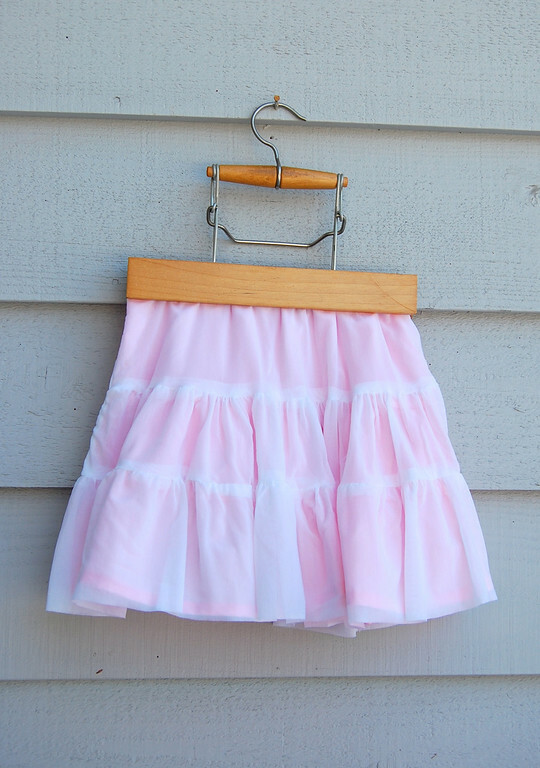 This is such a cute skirt! I love the inside-outness!! Thanks, Melissa! Yes, I've heard about this nylon chiffon, which apparently is different from polyester chiffon. I'm curious! I googled, and emailed a supplier for samples. 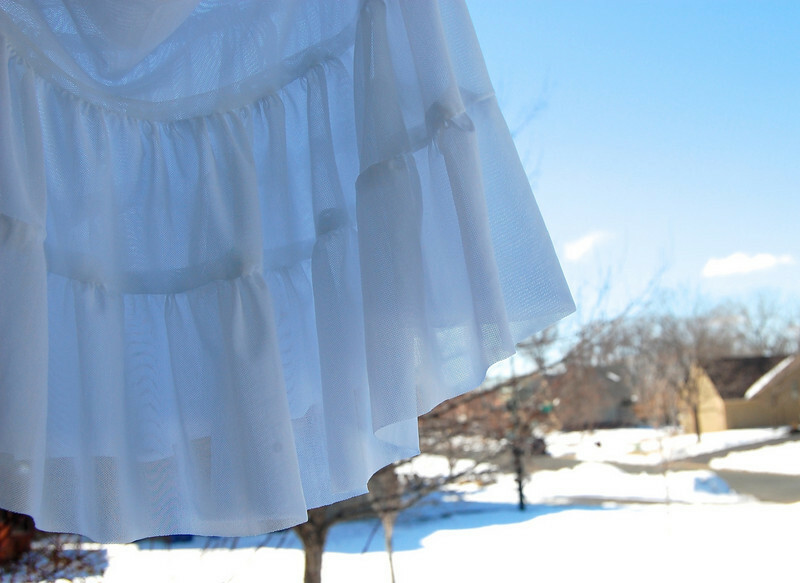 I have some dress-up skirts at home that we bought from garage sales, that are in a material that might be nylon chiffon. It IS soft, albeit floatier (i.e. more tutu-like) than power mesh. But I could be wrong. I'll wait for the samples to come in the post and update here. Excited! Love this! I'll be on the lookout for knit mesh the next time I'm at a fabric store. Question: When you're doing tiered gathered skirts do you sew up the side seams before or after attaching the layers together? Laura: before. So it's a matter of attaching loops of fabric to bigger (or smaller) loops of fabric. Thanks! I'll try it out on the next one. Thanks! I'll do that next time. I've been on the lookout for 'soft tulle' forEVER. Good to know I will find it at last. I'll be interested in you insights about nylon chiffon when you get your samples, too. 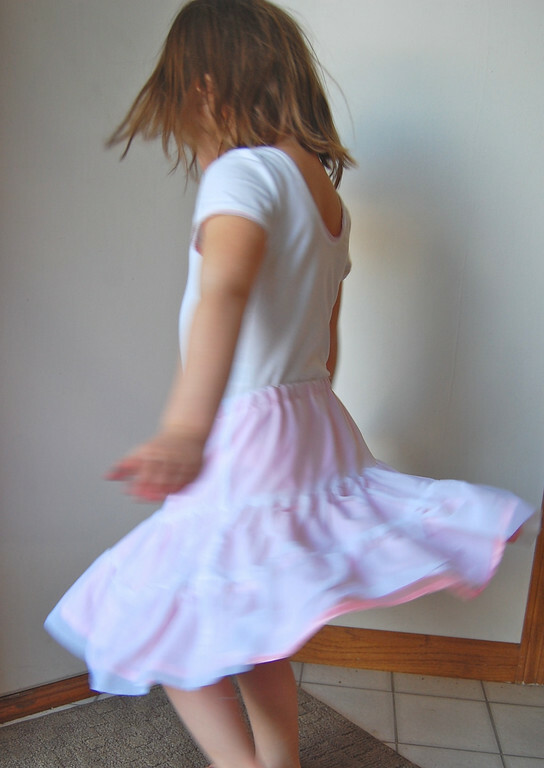 My girls have similar store bought skirts that they adore. Good to know I'll be able to replace them when the time comes.